Pair this Stuhrling quartz bracelet watch with casual or eclecticfashion for an attractive and complete look. 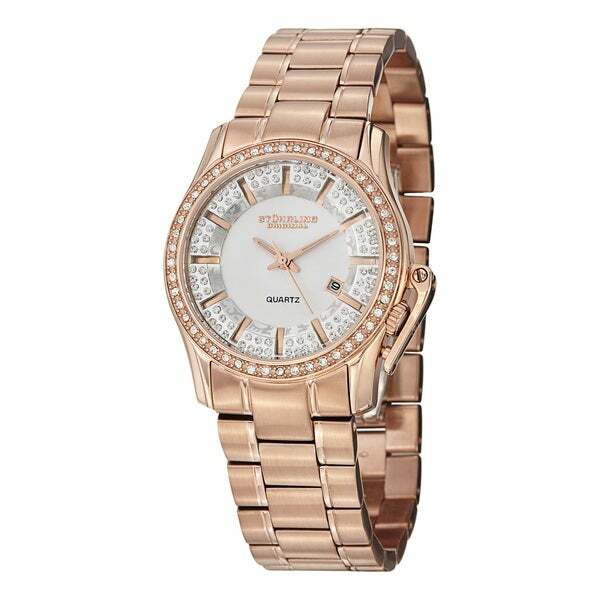 Featuring a stainlesssteel case for longevity and complete with gold and rose tonedetailing, this timepiece lend elegant style. The hands come in amix of gold, silver and rose hues for extra shimmer. The braceletwatch's dial window features Swarovski crystals in an impressiveconfiguration for a chic display. Click here to view our WatchSizing Guide. Wanting a gold watch and when I saw this steal of a deal on a Sturhling timepiece I decided to jump on it. So glad I did. It is one elegant piece. The Rose Gold and Swarovski crystals are amazing. This watch is fine. I wear it often, and get compliments. It isn't my favorite. The rose gold is fashionable. I would recommend this watch to my friends and family. I love this watch. I have several watches but find myself always picking this one to wear. It works for dressy or casual. I bought this watch for myself, and am well-pleased. It is stylish, attractive, and dependable. Would buy it again. Purchased this as a gift for a friend and cant wait to give it to her. Looks gorgeous and is awesome quality! I absolutely LOVE this watch. I wear it all the time. My watch arrived in an exquisite box and made a glorious presentation. I carefully placed it on my wrist and enjoyed it for all of about 6 hours before it decided to abruptly quit. I was very disheartened and sadly returned it. Love this watch...get tons of compliments! Great looking watch at a great price. Beautiful watch for the price!! Very pretty watch, pleasant surprise. I wanted to apply my rewards of $10.76 to this order. Like the looks and quality of it. It also received excellent reviews. because I liked the look of it and it is swiss.